Mt. Vernon, named in honor of George Washington's residence on the Potomac, is one of the oldest towns in southwest Missouri. 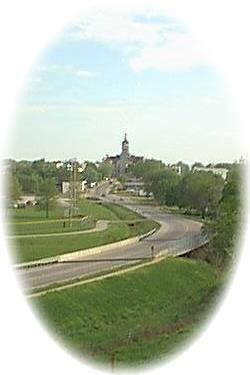 It is situated in the exact center of Lawrence county and was chosen as the county seat in 1845. Scores of Civil War skirmishes and battles occurred in Mt. Vernon with over 100,000 troops present in the area. There were both Union and Confederate camps in the northeast part of town and "town creek" on the north edge was a huge Calvary grazing area. A band of Confederate cavalrymen plummeted to their death over Rebel's Bluff where they lie buried today. A bent rifle from the site is displayed at the Lawrence County Historical Society Museum along with other historical and genealogical information and a restored 1845 double log cabin. Mt. Vernon is "The Home of Apple Butter Makin' Days" the second Friday and Saturday in October. Local people famous for making apple butter cook their product in large kettles on the courthouse lawn as the major attraction of the festival that has grown to be one of the largest in the state. Mt. Vernon is situated conveniently between two popular lakes - Table Rock and Stockton. It lies at the gateway of the Ozark Mountain Parkway, the scenic Route 265, which leads to the Branson tourist area. Among the many attractions within easy driving distance are the Branson music shows, Silver Dollar City, Shepherd of the Hills, Roaring River State Park and Trout Farm, Elk River canoeing, Eureka Springs, Arkansas, and its Passion Play and Fantastic Caverns. Closer to home is Mickey Own Baseball School northeast of Mt. Vernon. The community's largest employer is the Missouri Rehabilitation Center, which offers rehabilitation services and continues to serve people suffering from tuberculosis and chest diseases. It operates the largest head injury rehabilitation program in the state and is known throughout the nation for its ventilator program. Since its construction in 1906, it has been known as the State Sanatorium and Missouri State Chest Hospital, expanding its role over the years as health care service evolved. The department of Veterans Affairs opened the Gene Taylor Satellite Outpatient Clinic in Mr. Vernon in early 1990. It provides outpatient treatment to veterans locally eligible for such recurring treatment. The Missouri Veteran's Home/Mt. Vernon offers skilled nursing home care to veterans throughout the area. The state facility was the second of its kind when it opened in 1982. The beautiful, stately, historic church, known familiarly as Brick Church because of its 17-inch thick brick walls, stands solidly in a picturesque setting of prairie land. The county's first log jail burned in 1854, and a brick structure was built on Walter Street a block west of the square. It is presently undergoing reconstruction for historical preservation. It was used until 1868, and had an original cost of $3,500. Mt. Vernon's golf course features a nine-hole course, clubhouse, and golf cart rental and storage. There are a number of active leagues, including a senior men's league and Ladies' Golf Association.